Kashkari is not the only high-profile South Asian making news in the midst of the biggest financial crisis US has faced since the Great Depression of the 1930s. Vikram Pandit, also an engineer and the current CEO of Citigroup, is credited with saving his firm from meeting the same fate as Lehman Brothers. He engineered the rescue without Uncle Sam's help. Recently, though, he suffered a setback when Wachovia spurned Citigroup's bid to buy it and chose to go with Wells Fargo instead. 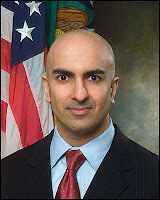 You say Kashkari is a Kashmiri-American. His parents are probably displaced Kashmiri Pandits. So, do you agree that the Kasmir issue has more shades of grey, and it is quite impossible to just grant the wishes of the Muslim majority without taking into account the wishes of the displaced Hindu pandits.